Smallville News:Despite a ratings growth for the popular CW series Smallville, actor availability may be an issue to the show continuing into season 9. 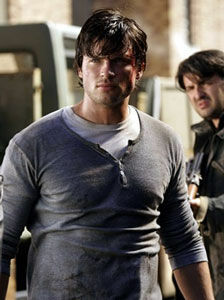 Or, more to the point, the issue would seem to be whether Tom Welling is willing to return. Welling's reps haven't answered calls, and show runner Darren Swimmer is ready to create a series finale in the event Welling doesn't return. It's apparently a complicated situation. What conflict? Smallville is carrying the franchise. How can that be an issue NOW, when it was previously recanted over and over as nothing but a rule by the previous show runners? Eh. It's "the game" of the system I guess. News about Al Gough and Miles Millar:In the way-off chance that there are fans of Al Gough and Miles Millar out there, they've been busy on their own time these days. One of their newer projects is a supernatural based spec script called Salisbury that they put together based on a fictional town where supernatural things happen... Go figure. It's going to have a youthful cast and smells a little bit like Supernatural (on The CW) meets Twilight. What do you think? They're also working on a Disney effort called Jungle Cruise and is based on a theme park ride. Wow, there's a complete genre jump! In addition to that they're looking at working on a live action version of Robotech. Go-llar's (my code name for the two of them since they seem to always be in the same place all the time) latest piece of work was writing The Mummy: Tomb of the Dragon Emperor. 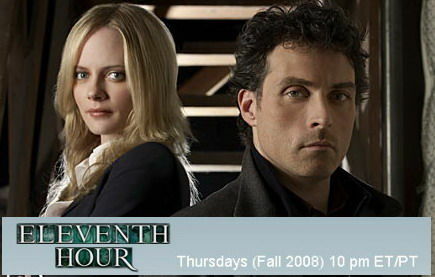 Eleventh Hour gets more hoursEleventh Hour is going into the twelfth, thirteenth, fourteenth and so on, well, more hours. CBS has ordered 5 additional episodes over the initial order of the show, making it an 18 episode count for the 1st season run. Some popular, yet short lived shows are returning for rerunsThe Sci-Fi Channel is making some strides, or attempts at it to get more viewers aligned with what we think the network should be airing. Sci-Fi has Ghost Whisperer lined up to start airing repeats in January of 2009. For whatever reason, I sometimes find myself watching Ghost Whisperer on CBS, for the story. Really. Actually, they've got a doozy of a story line going on right now. The story twist is a nice new approach to the old story outline that kept happening every week. It's made it interesting. The CW is taking its shot at grabbing fans of past popular shows. 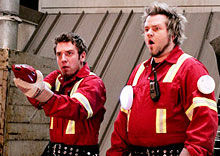 Effective November 30th, The CW is replaying Jericho on Sunday nights. I haven't confirmed that, but if you enjoyed the show and have nothing better to do, I guess you can help The CW compete with animation Sunday on Fox and check it out. (ENI)The Beast on A&EI wanted to say something about a new show coming at us called The Beast on A&E. I'm a fairly healthy guy and there are some days that getting to work is the biggest chore in the world. Gravity weighs on me, the clock taunts me and leaving the warm comfy environment of my home to walk my dog at 5 am is a challenge to my instincts to stay in bed. Yet Patrick Swayze, while in the battle of his life fighting pancreatic cancer, goes on and makes a new show called The Beast. To me, The Beast is really about an actor who's putting it out there and doing his job, for us, the audience despite his personal circumstance. Before The Beast, I last saw Swayze earlier this year in a Sci-Fi Saturday night flick and he looked pretty plump. In fact he was so plump that I only recognized him after he spoke. Now, he's a gaunt figure of a man and I can't say how distracting that will be. I'm used to his past roles of daring physical prowess on the dance floor or bouncing at the door of a bar. I've enjoyed his career, even if it's not been stellar, but I can say it's been enjoyable and I can only hope this isn't his last project. Give it a nod. Give it a chance. I hope we're surprised by it. Thanks for putting up with that little reflection.